»LGBT»BeLonG To: It’s Not Too Late To Take Part In Stand Up Awareness Week! BeLonG To: It’s Not Too Late To Take Part In Stand Up Awareness Week! It’s not too late for your youth service to take part in Belong To’s Stand Up Awareness Week from November 13th-18th, 2017. 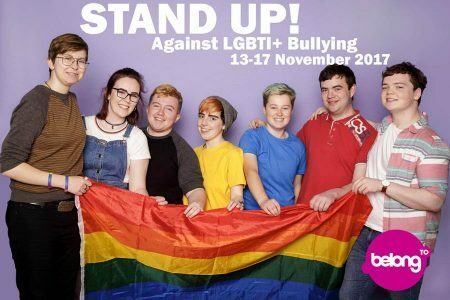 You can visit their website today to download a free Stand Up pack including a resource brimming with activity ideas, and a primer on LGBTI+ terminology for you and your colleagues. BeLonG To also have a host of LGBTI+ videos available for you to share with members of your youth service. These include a series of videos that young trans people have created to explain what being transgender means, how you can be an ally, and what coming out as trans is like. They hope you will join them for this year’s Stand Up Week.